Kaleidoscope regularly supply actors and dancers for themed events around the country. 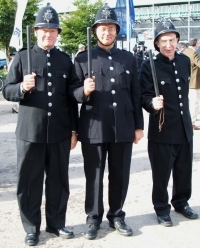 Our comedy policemen (dressed in period costumes complete with truncheons and handcuffs), provide audiences with laughter, comedy songs and humorous dits! Our clients often ask us to organise dancers to appear alongside well known Jive & Swing bands including the Jive Aces, Ooh Bop Sh’bam, Kaleidoscope Big Band and King Pleasure. As well as providing high energy dance sets, the dancers will also teach anyone new to Jiving, a few simple steps to get them involved with the action! Watch the video link below to see our dancers in action!